Eating Fruit - Website of torbaystrokesurvivors! Eating Fruit on an empty stomach.....IMPORTANT READ!!! Dr. Stephen Mak treats terminal ill cancer patients by "un-orthodox" way and many patients recovered. He explains: before he is using solar energy to clear the illnesses of his patients. He believes on natural healing in the body against illnesses. See the article below. It is one of the strategies to heal cancer. As of late, my success rate in curing cancer is about 80%. Cancer patients shouldn't die. The cure for cancer is already found. It is whether you believe it or not. I am sorry for the hundreds of cancer patients who die under the conventional treatments. We all think eating fruits means just buying fruits, cutting it and just popping it into our mouths. It's not as easy as you think. It's important to know how and when to eat. What is the correct way of eating fruits? IT MEANS NOT EATING FRUITS AFTER YOUR MEALS! 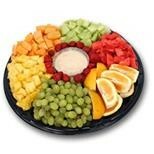 * FRUITS SHOULD BE EATEN ON AN EMPTY STOMACH. If you eat fruit like that, it will play a major role to detoxify your system, supplying you with a great deal of energy for weight loss and other life activities. FRUIT IS THE MOST IMPORTANT FOOD. Let's say you eat two slices of bread and then a slice of fruit. The slice of fruit is ready to go straight through the stomach into the intestines, but it is prevented from doing so. In the meantime the whole meal rots and ferments and turns to acid. The minute the fruit comes into contact with the food in the stomach and digestive juices, the entire mass of food begins to spoil.... So please eat your fruits on an empty stomach or before your meals! You have heard people complaining — every time I eat watermelon I burp, when I eat durian my stomach bloats up, when I eat a banana I feel like running to the toilet, etc — actually all this will not arise if you eat the fruit on an empty stomach. The fruit mixes with the putrefying other food and produces gas and hence you will bloat! When you need to drink fruit juice - drink only fresh fruit juice, NOT from the cans. Don't even drink juice that has been heated up. Don't eat cooked fruits because you don't get the nutrients at all. You only get to taste. Cooking destroys all the vitamins. But eating a whole fruit is better than drinking the juice. If you should drink the juice, drink it mouthful by mouthful slowly, because you must let it mix with your saliva before swallowing it. You can go on a 3-day fruit fast to cleanse your body. Just eat fruits and drink fruit juice throughout the 3 days and you will be surprised when your friends tell you how radiant you look! ORANGE: Sweetest medicine. Taking 2 to 4 oranges a day may help keep colds away, lower cholesterol, prevent & dissolve kidney stones as well as lessens the risk of colon cancer.